end with your dream skateboard. 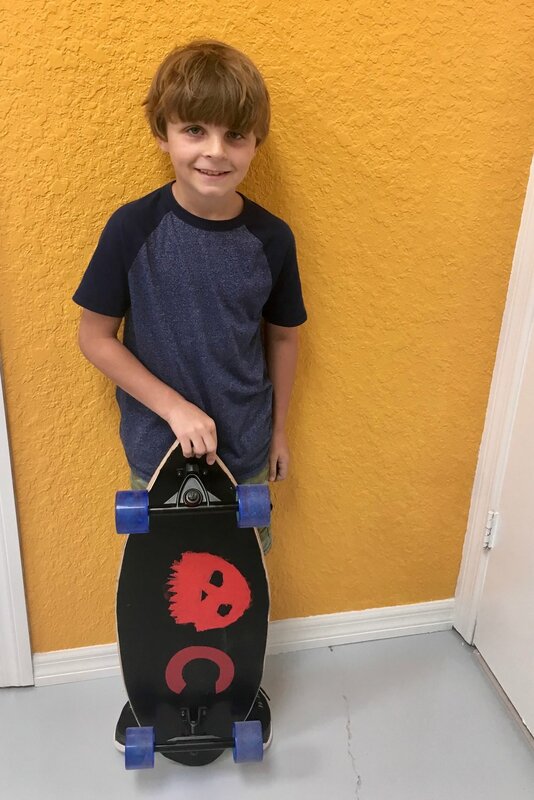 build your own custom skateboard! A skateboard is the perfect blend of utility, fun, mobility and self expression. 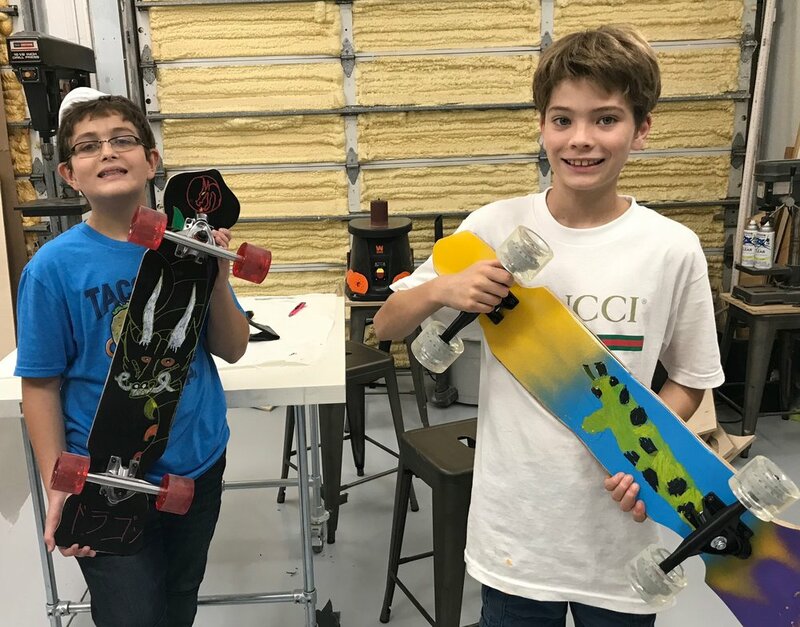 But why settle for a store-bought board when you can build your own — turning bare wood into a 100% custom skateboard — in one of Bolts & Bytes’ Skateboard Design Classes? 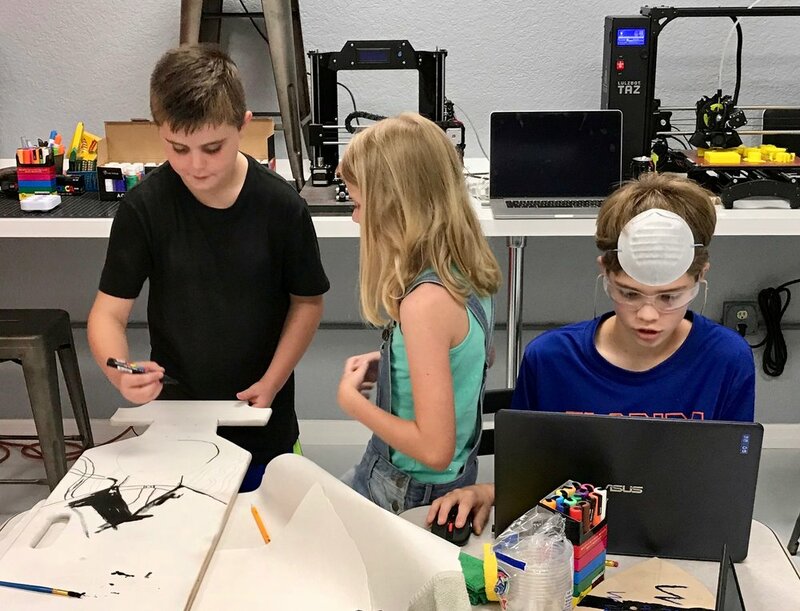 Our classes and camps take students through the entire design process, from research and planning to woodworking to art design and final build. This is a very hands-on class where we learn safe tool use, practice craftsmanship and use problem-solving skills to take our ideas from concept to completion. At the conclusion of the class, every student walks out (rolls out?) with a totally custom skateboard of their own design that they built themselves from scratch. What is the perfect skateboard deck layout? It’s the one that you design and create yourself. First we research skateboard designs and choose a deck layout that matches student’s goals. Then students receive safety training and monitored practice on all tools before cutting and shaping their decks. Our students are so creative and this is where that creativity really shines. 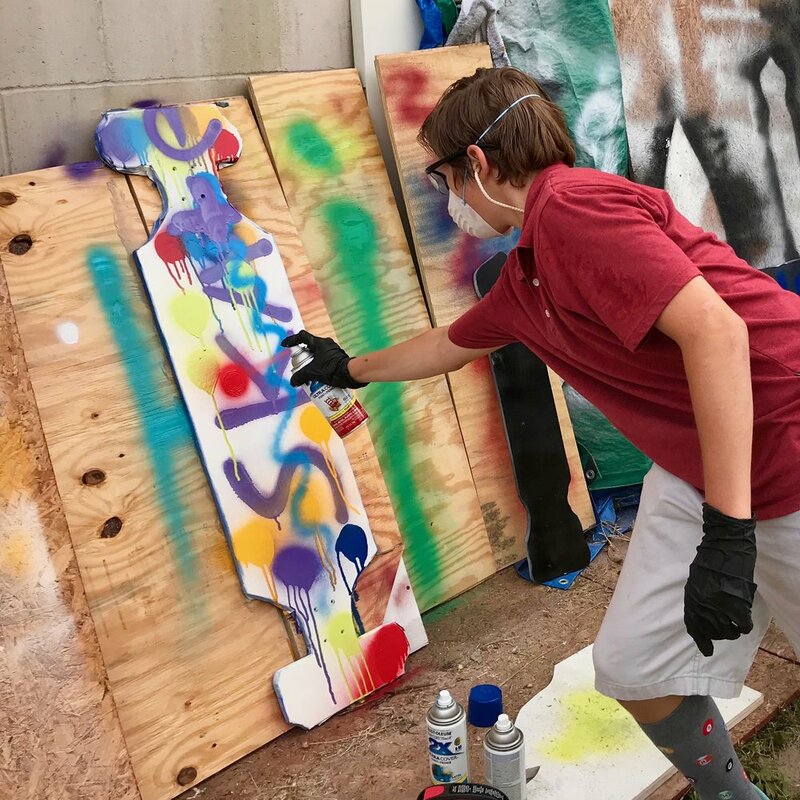 From stencils to spray paint to cut vinyl art to hand-painted murals, no two skateboard decks are alike at Bolts & Bytes! Each deck is an expression of its builder & rider — so we spend time planning and sketching before the first paint hits wood. The final product — a 100% made-by-me custom skateboard! Students select their choice of wheels and trucks before applying grip tape to perfectly compliment their new decks. 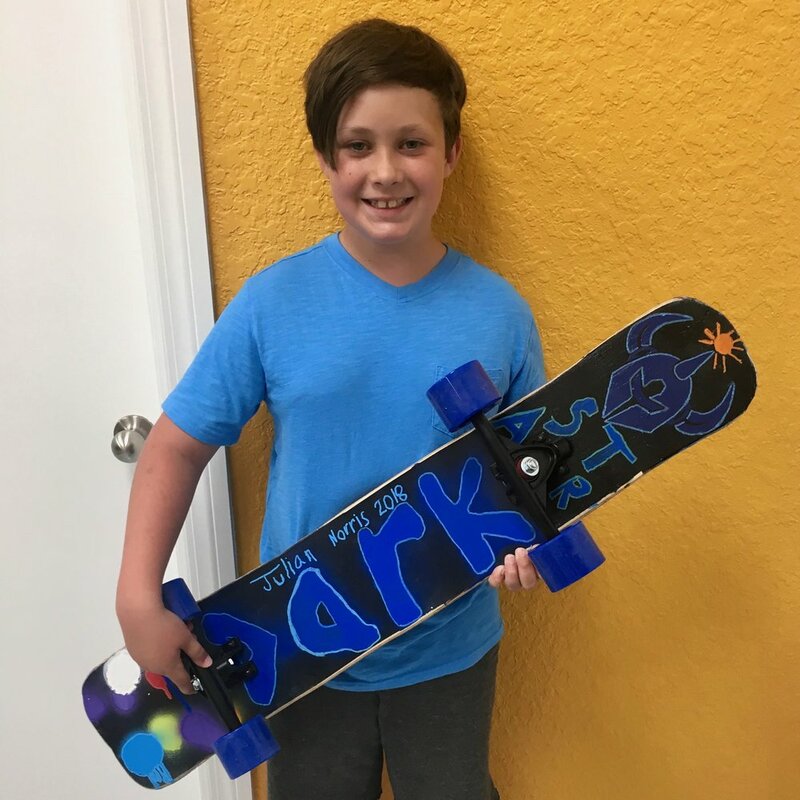 Each student rolls out of class with a unique, working skateboard that they built and made themselves. It doesn’t get much better than that! 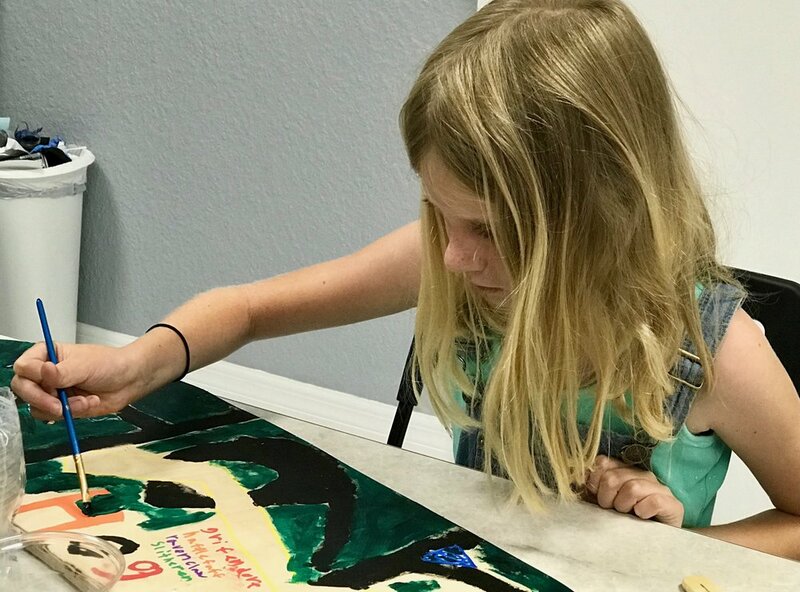 * Take advantage of our Early Bird Special — Save 20% off all Summer Camp registrations made before Mar. 31st, 2019! PLUS get an additional 10% savings on your second Summer Camp and any others you join all summer! WHAT KINDS OF BOARDS DO YOU MAKE? 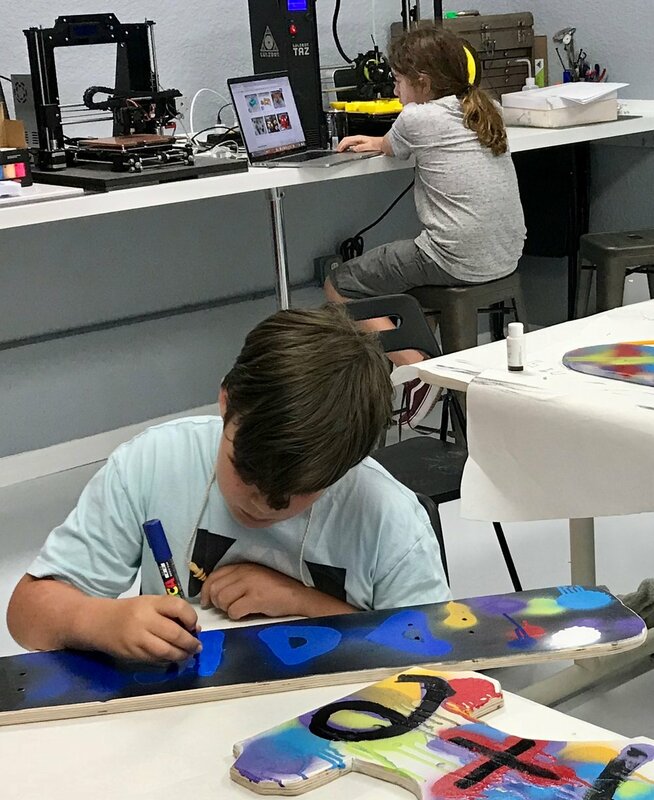 In our current classes we make flat cruiser-style skateboards, also known as longboards or gravity boards. These boards are flat, without a kick-flip, and are perfect for cruising around town rather than shredding up the local half-pipe. Length, width and design are completely up to the student, but the 48” x 12” blank for their deck is generous enough for virtually any configuration. We use specialty 11-ply baltic birch plywood for our decks which provide superior strength and a comfortable flex for even the longest boards. Yep! The deck, trucks, riser pads, wheels, black grip tape and all hardware are included. Students are given their choice of wheel color and truck style from packages that we have already tested and vetted for quality and longevity. If your student has special requests, like a particular brand of wheel or truck, please contact us to make arrangements. HOW LARGE IS THE CLASS? WHAT ARE THE AGES? For safety reasons, this class is capped at 8 students and is open to students ages 11 - 16. I WANT IN! HOW CAN I REGISTER? You can register right here! We’re happy to help! Just contact us by email or phone. © Bolts & Bytes Maker Academy, Inc.